In order to get to Book Expo America, I had to take a train, and then lots of subway rides of some length, and so obviously I needed to take a book with me, one that would be strong enough so that even after I was distracted by the shinny and the new I would see it through to the end and be glad to have read it. 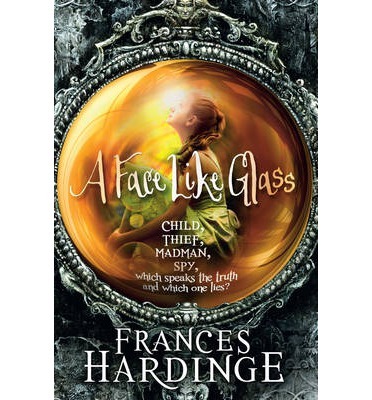 A Face Like Glass take place inside a mountain burrowed through with caverns and tunnels and chambers providing enough space for a whole strange society to live in. There is magic to the craft work of those in power, that brings wealth to the world of Caverna; cheese that explodes, mind-manipulative perfumes and wines, and other wonders, and there's also magic in Caverna herself; the tunnels don't all obey natural laws, and her cartographers all go mad....And the people of Caverna are strange as well, with faces that are still and expressionless as dolls. Smiles and frowns must be taught, and cost money. It is both simple and complicated, and a really nice one to give to the smart older middle grade reader who wants more from their fantasy than straight up adventure. It is a twisty one, with a lovely, fascinating, horrible setting, and a satisfying mystery (although I feel I could have guessed). Sometimes Hardinge seems to appreciate her descriptions a smidge too much (which is to say, more than I did), but apart from that I can't in honesty say it should be any tighter or more compressed. It doesn't seem to be out in the US yet...but it is well worth ordering from the UK! This sounds like a very creative story! I've been having trouble lately finding middle grade that really hooks me...maybe this one will do the trick. Wow... this sounds like a great book! Definitely going on my TBR list! Oh I forgot this wasn't yet out in the US! Is that true? I thought it must be, because Cuckoo Song is out in the US now, and that one's newer than this one, I think. Have, oh, have you read Cuckoo Song yet? It's awfully good!